It’s a classic battle. On one side are the corporations who would inject millions of dollars into struggling rural economies and justify the action as an economic benefit pitted against National environmental groups who state it will pose a threat to public safety and a risk to the environment. If you live in the northwest and have ever made it to the Sturgis Motorcycle Rally then you’ve likely traveled over Lolo Pass, (U.S. Highway 12). I’ve ridden this route several times to and from Sturgis. In fact, last year our group traveled this route from the East going West and were amazed at the high-quality level of what seemed like freshly laid asphalt. The route hugs the serpentine banks of the Clearwater and Lochsa Rivers and road signs bear the silhouettes of the 19th-century explorers Lewis and Clark. There is a particular interesting segment of the highway where you’ll read signs proclaiming the next 99-miles is nothing but S-curves. And they are not kidding! The National Scenic Byway is a treasure and one that should to be experienced by motorcycle enthusiasts slowly in appreciation. So what’s the issue? Well it’s complicated… a local issue having global impacts. 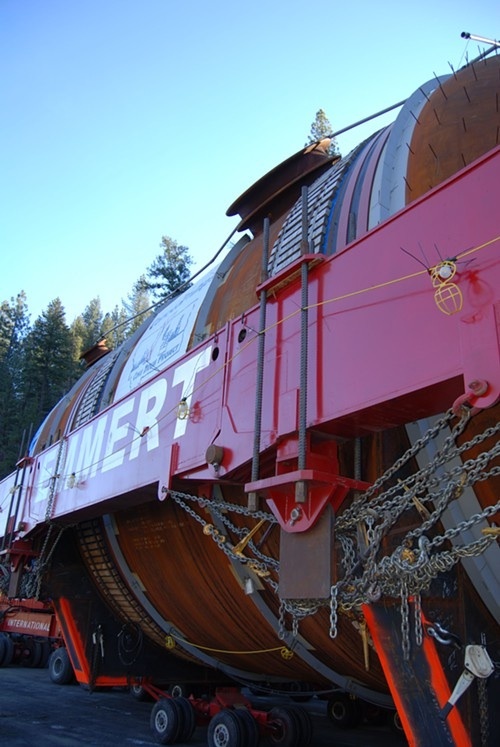 It’s not well known, but Imperial Oil and ConocoPhillips are planning to ship hundreds of tons of oil equipment up the Columbia River, destined for the Kearl Lake oil sands project near Fort McMurray in Alberta as part of the Kearl Module Transport Project (KMTP). Once those shipments reach Lewiston on the Washington/Idaho border they will then be loaded on to gigantic, multi-lane wide trucks weighing upwards of 500,000 lbs (semi-trucks generally max out at 80,000 lbs), and from there, the equipment would inch its way along Idaho’s stretch of U.S. 12, through the Clearwater National Forest, into Montana and points beyond (See map above). These so-called “megaloads” could be up to 3-stories high, occupy 24 feet side-to-side (the full width of U.S. 12) and be 200 feet long. The companies will spend more $21 million for permits and hundreds of highway modifications to accommodate the loads. What we have here is a French company shipping Korean-made products on Dutch trucks to a Canadian work-site, that has the potential to destroy one of our most prestigious scenic byways and flagship motorcycle routes in the northwest! As is always the case in these type situations both sides ‘lawyered up’ and in record time it was run through the Idaho Supreme Court who in January ruled/approved 4-shipments through the “permanent” corridor. More information is available in a well researched and fact-filled article by Alex Sakariassen (Missoulan News) that provides a great overview of the various factors in this issue that impacts Idaho and Montana residents; now and in the future. Since the ruling, the second “mega-load” left Lewiston last Thursday night. And as you might expect, winter weather got worse and the “mega-load” was held in position for, as Idaho Transportation Department (ITD) claimed, “routine vehicle maintenance”. The short journey is now taking at least 11 days! And if that wasn’t enough to make you scratch your head, Emmert International is using Idaho State Police (ISP) as escorts for the ConocoPhillips mega-load transports. Emmert is footing the bill, but Idaho lawmakers still have to give their authorization/approval for overtime and associated costs for Idaho troopers to accompany the mega-loads. Next up is surely a Discovery Channel series… chronicles of the “mega-load” where the burly, bearded, sleep deprived, derring-do drivers and swashbuckling navigators traverse Lolo Pass with the threat of activists breaking rigs or plunging into the ice-cold river to haul their indispensable cargo to the Canadian oil mines… An ideological conflict and adventure on Monday nights at 9pm central. Advertising sponsors could be BP and that would bring an end to a great highway for motorcyclists! UPDATE: February 28, 2011 – According to this report Imperial Oil confirmed that due to weather delays they will be downsizing the 30 “mega-loads” into 60 smaller loads for the freeways and bypassing the more direct route on Hwy 12 through Idaho and Montana. So, after telling the public for more than a year there were no alternative routes…suddenly the oil company gets slowed down and they find an alternative route…somethings fishy in Idaho! Photo’s courtesy of Boise Weekly (Emmert); NY Times (Map).